If you plan on visiting Lincolnshire, you can take a run around the business park of Lincolnshire, Riverwoods. Here, you'll find the International Union, United Automobile, Aerospace and Agricultural Implement Workers of America or UAW for short. This union organization plays a vital role in the work place, from setting standards for worker's pay to passing legislation for programs such as Medicare and Medicade. Just like keeping up with your union dues, you have to keep up with your flagpoles too. The UAW clearly has done that as we took a closer look at these three vertical Wall Mount Flagpoles. We wish we could have visited on a day with the flags up flying on the poles, but with winds of 40 mph, we are sure, they lowered the flags. Then investigating closer it is clear they were not flying flags for the winter months. They had removed some of the hardware and raised the ropes and remaining hardware rigging to the top of the flagpoles to wait for warmer weather in March. If you are unsure whether it is safe to fly flags in your area, you can check your weather specific to your flag display at the FlagDesk Flag Weather Tool. This year has been more drastic than last and it has been quickly changing seemingly hour to hour. Freezing rain to high winds to almost 70º and back down to negative numbers. It seems impossible to keep up. But if you have the foresight to keep an eye on the weather, you can rescue your flags from early fraying. So why are these flagpoles special? You do not often see internal cam cleat vertical wall mount flagpoles. Internal flagpoles have rope systems on the inside of the flagpole. The rope is secured to either a winch or a cam cleat. Internal flagpoles are considered deluxe with a cleaner appearance. So why are vertical wall mount flagpoles almost never internal? The answer is convenience. Flag management is all about accessibility. 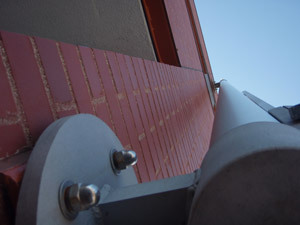 Most wall mounted flagpoles are not located on the ground like these are, but located towards the top of the building wall. It would be very difficult to change the flag if you had to access an access door from that vantage point on a lot of these applications. In this case, the poles were mounted to a wall just outside the building. The pole access door can be reached from the ground.